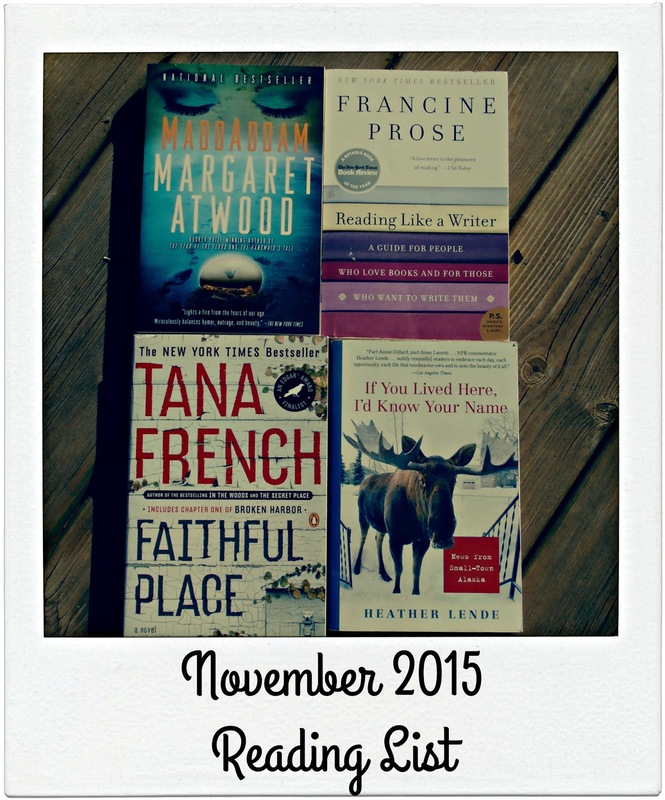 MaddAddam by Margaret Atwood- This was from my April list. I got it from my Broke and Bookish secret Santa last year, and really think it's time I read it! Reading Like a Writer by Francine Prose- This one was on my June list, but never got read. I bought it on Amazon a couple years ago but never got around to it. Since I'm not going to do NaNoWrMo, I figured this might be a good, albeit weak, alternative. If You Lived Here, I'd Know Your Name by Heather Lende- This was a pick from way back in February! The blurb on the front says it's part Anne Lamott and part Annie Dilliard, and after discovering Anne Lamott this year, I want to read it all the more! Faithful Place by Tana French- I added this to my list just last month, and I was really looking forward to reading it, but didn't get through the books I had started in September! I love Tana French so I'm excited to read it! So, even though it's going to be a busy month, I'm hoping to get through my reads for November by reading more and wasting time surfing online less. What are you hoping to read?